In 1968, ninety-eight competitors stormed out of London on the world’s greatest automotive adventure, the London to Sydney Marathon, the most ambitious and epic car race ever staged. Four weeks later they arrived in Sydney-or at least half of them did. The others lay in ruin along its 10,000-mile route. Unimaginable now in either concept or execution, the marathon captured the rapt attention of the countries through which it passed, and of the world, as it created front-page news. It was more than a car race, more than a rally, more than the trials that opened up outback Australia only a decade before: it was the world’s most gruelling test of driver and vehicle. John Smailes was a young journalist at the time, covering the race for the Sydney Daily Telegraph. 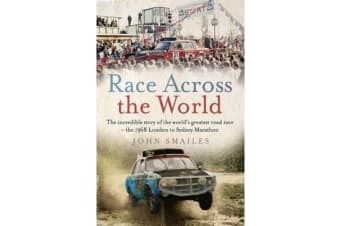 Fifty years after this extraordinary race was run, John’s dramatic, compelling and utterly fascinating story-drawing on his own first-hand, eyewitness account and enhanced by in-depth interviews over the intervening years with all the race’s key participants-brings the marathon vividly to life.